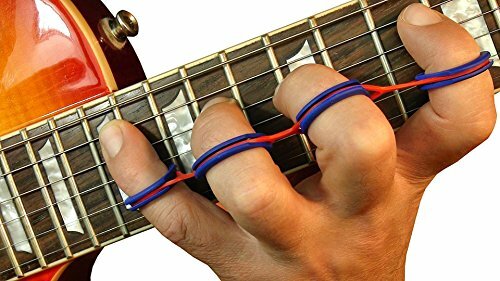 Music Muscles Instruments and Rehab Single Hand Finger Exercise Device to be used while Practicing or Rehabbing for the following Applications: Guitar, Bass, Banjo, Violin, Viola, Cello, Trumpet, Single Hand Finger / Hand / Wrist / Forearm Rehabilitation. Light Weight, Comfortable, Intelligently Engineered. Increase Finger Speed, Strength and Agility WHILE PRACTICING or Rehabbing. 20 Ring Kit Guaranteed To Fit All Finger Sizes. Multiple Levels of Elasticity - 5 Light and 5 Heavy Four Finger Tension Bands. 5 Light and 5 Heavy Five Finger Tension Bands. If you have any questions about this product by Music Muscles LLC - Instruments and Rehab, contact us by completing and submitting the form below. If you are looking for a specif part number, please include it with your message.